If you were to ask any photographer whats your favourite image? You most likely would get a different answer every time you asked that question. Im no different, every time I look through my images collection I find a new favourite! This months images is from a recent visit to the Czech Republic where I was photographing birds of prey in controlled conditions, the raptors photographed on this trip are rescued and cared for by a very passionate conservationist Helena Kuchynková (www.stanicestop.cz). 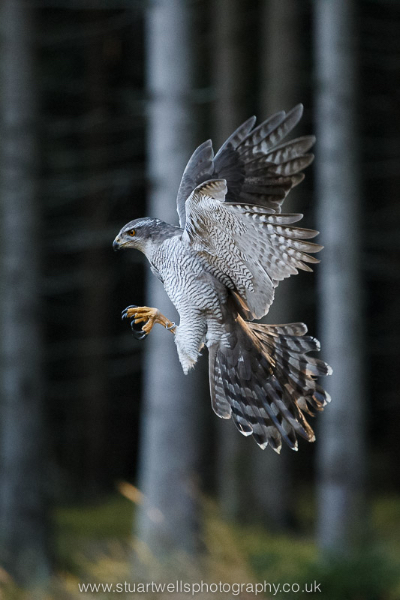 I like this image as it shows the Goshawk seconds before landing, you can see how the raptor uses every individual feather in its wings and tail to control its landing, along with the preparation of its talons.